Hirsh Sawhney, assistant professor of English, is the author of a recent work of fiction titled The Diary of Rehan Malhotra, published as an e-book by Juggernaut Books (2017). 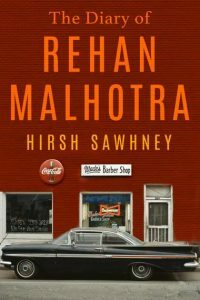 In this timely story, Rehan, the son of a Muslim mother and Hindu father, is a middle-aged high school teacher in New Haven, Conn., who struggles with his growing estrangement from his wife and the affluent, white community in which he lives. A charged encounter with a neighbor causes him to look back on his troubled teenage years, when he used and sold drugs, and when he forged a problematic friendship with a young black man named Ink. The Diary of Rehan Malhotra casts a spotlight on the invisible walls that divide city from suburb, which keep some people safe and others confined. It is a meditation on the possibilities and limitations of literature as a cure for social ills. The story costs 10 rupees, or 15 cents, and is being published as a part of Juggernaut’s efforts to get inexpensive, quality literature to as diverse a readership as possible. Sawhney is also the author of South Haven and the editor of Delhi Noir. He also collaborated with Amy Bloom ’75 on New Haven Noir, Hirsh has lived in Delhi, London and New York City.